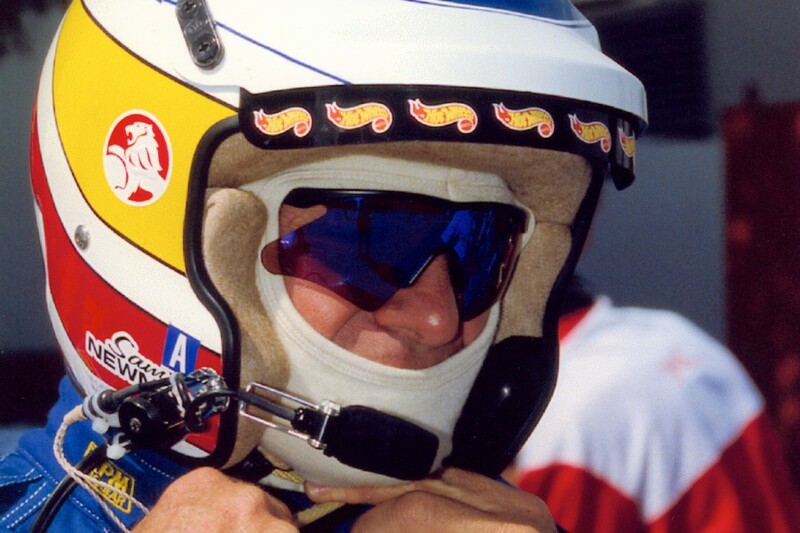 There have been a number of high-profile cameo appearances in Supercars over the years, but none more left-field than AFL legend and controversial TV star John ‘Sam’ Newman. Known for his love of motoring and motorsport, Newman was one of the greats of the Geelong Football Club in the 1960s and 70s, and is perhaps even better known as a colourful and outspoken AFL media personality on ‘The Footy Show’. But for one weekend in 2000, the man nowadays referred to as ‘Fossil’ was also a Supercar driver. Newman took up motorsport in the late 1990s. 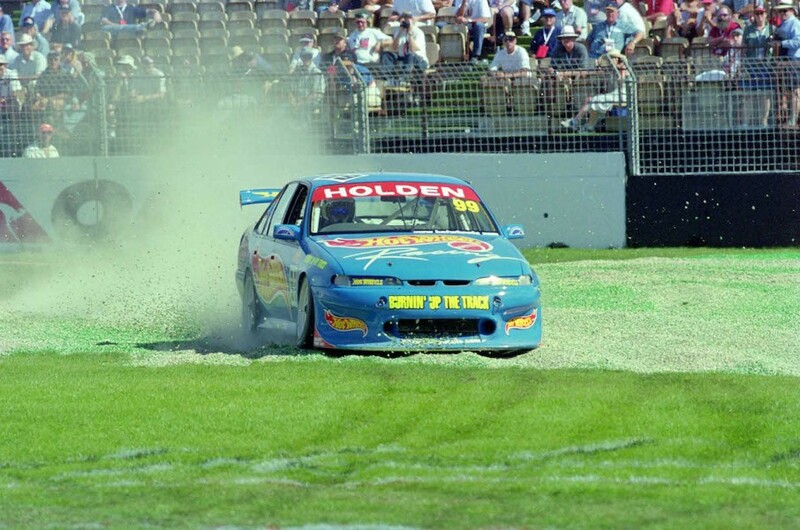 In 2000, he raced a Holden Vectra in the GT Production category alongside former Castrol Cougar Melinda Price as part of a two-car, Kmart-backed effort run by Gibson Motorsport. He also competed in a Ferrari in the Nations Cup [and later a Lamborghini] and famously scored pole position for the 2001 Sandown 500 [then run for production cars] after taking advantage of a dry circuit while the others did their lap time in the wet. 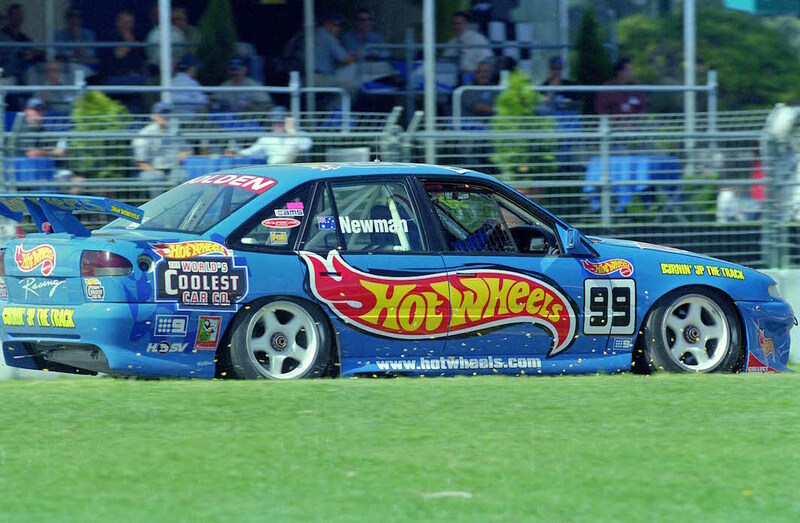 In a publicity stunt for the 2000 Australian Grand Prix meeting, Newman entered the non-championship V8 Supercar support races in a Hot Wheels-sponsored VS Commodore as a wildcard entry. Prepared by Gibson Motorsport, Newman’s car was run alongside the team’s regular Kmart entries of Greg Murphy and Steven Richards. It was a massive jump into the deep end for the 300-game VFL/AFL veteran who qualified 30th and last, with his best lap of 2m13.629s – almost 16 seconds slower than Mark Skaife’s pole time. But to his credit, Newman stayed out of trouble and finished all three races in 23rd, 24th and 23rd respectively, keeping his #99 Commodore on the track and out of trouble. In fact, he made significant gains as the weekend progressed, getting within eight seconds of the leader's pace by Sunday afternoon’s final six-lapper. The real headlines in the non-championship races were being made at the front of the field due to several controversial incidents, triggering a war of words between Paul Radisich, Mark Skaife and Garth Tander. Meanwhile, Paul Morris dispatched Neil Crompton and Todd Kelly in Race 3 and earned himself a $10,000 fine and had his racing license suspended for seven days. Having survived the three races, Newman told Motorsport News that he was pleased to keep his Hot Wheels Commodore car straight … unlike many others. “A successful day is not being in casualty at the end of it,” Newman said. “I learned two things today. The first thing is that I would have ended up on the podium had this race been a 50 lapper as no one else would have been left … they were all taking themselves out.